Travel rewards credit cards are all the rage these days. The truth is, just about everyone out there loves to travel. The vast majority of consumers in developed nations use credit cards. So, when you attach travel rewards to credit cards, it’s bound to be an overnight sensation. Let’s face it, who wouldn’t want to travel at the expense of their credit card lender? However, not all travel rewards credit cards were created equally, not to mention different ways of using them can help you really maximize on the rewards potential of the card. That being said, today, we’re going to talk about how to get the most travel out of your credit card rewards! Step By Step Guide To Earning More! Step #1: Choose The Credit Card That Offers The Most – Travel rewards credit cards generally have a specific value per point earned. Some of those may be $0.005 per point earned which is pretty low. The average is around $0.01 per point. However, if you search hard, you can find offers with much higher values. The highest point value that I can remember seeing is 2.2% offered by the Barclaycard Arrival World MasterCard. For more information on that offer, click here ! Step #2: Create A Spending Plan – We all spend money on a regular basis. It’s how we get food, clothing, and anything else we need. To earn points, you’re going to have to spend money using your credit card. However, you don’t want to pay interest on your purchases because if you do, you’re not really earning your rewards, you paying for them. That being said, figure out how much money you usually spend in cash on a monthly basis for things like food, gas, clothing ect. Now, you’re going to use your card for those purchases. Don’t worry, you won’t pay interest on them. Step #3: Start A Savings Account – When you spend money on your credit card, you have to pay it back. So, since the money is already spent, it’s good to have a good place to put the cash while it’s waiting to be paid to your lender. For me, the best place to put it is in an interest bearing savings account. This way, while you’re waiting to make your payment, you’re earning more! Step #4: Nightly Transfers To Savings – It’s important to do this nightly to make sure that you’ve got the funds available to pay your card off before the grace period. Every night, before going to bed, add up all money that you’ve spent on your credit card. Now, go online and transfer that amount of money from your checking account to your savings account. This way, when it comes time to pay, you’ve got the money waiting. Until then, you’re earning interest on the savings total! Step #5: Pay Your Balance Off Every 2 Weeks – The grace period on most credit cards ranges from 2 weeks to a month. Paying your balance off every 2 weeks is a sure way to make sure that you’re paid up within the grace period. However, the 2 week mark is a mark just to be safe. Look at the grace period on your credit card for the time you have available. After all, the longer the money sits in savings, the more you earn. With the Barclaycard Arrival World MasterCard that I mentioned earlier, the grace period is 23 days. So, you can feasibly pay your balance every 3 weeks and stay within the grace period while earning interest for an extra week. It’s that simple, making sure that you get more for travel for your swipe from your credit card really is a pretty easy process. However, it’s important to keep in mind that if you’re going to follow this plan, you need to make sure that you follow it to the T. After all, if you don’t pay your balance off within the grace period, you’ll be charged interest. If you do it too much and rack up a high balance, you could find yourself in the midst of a financial hardship. Do you use travel rewards credit cards? If so, where was your favorite place to travel when using your rewards? I’ve only recently learned about free travel with credit card churning. I’ve seen a bunch of posts around the pf blogosphere recently explaining exactly how it all works and I’m pretty excited to give it a try. As long as you pay off your balances in full (and I do) there’s really nothing to lose and only free trips to gain! I originally got into collecting United miles a year ago because it’s the only airline that flies to Aspen, where my sisters live. It’s a pretty expensive destination, with ticket prices from my home airport of Newark hovering around $700 RT even in the off-season. So each mile is worth nearly 3 cents to me. I also used “blew” United miles on two one-ways at either end of the Trans-Siberian Railway trip I took a few months ago because one-way tickets to St Petersburg and then from Beijing would have been cost prohibitive…like coach class with crappy multiple connections for $3500. Nice guide on how to earn points while not overspending with credit cards. Making sure you only use the card for your essential spending – gas, groceries, etc. helps to keep you from not overspending. There are some good rewards program out there. I’ve been reading up on pf blogs to see which one I want to take advantage of this year for travel. The last one I used was from Chase United Mileage Plus Card. I got a R/T ticket to London last year. Yes I use travel rewards. I really enjoyed my trip to Bali. My trip to Myanmar was great too. And I’m looking forward to my trip to India this year. 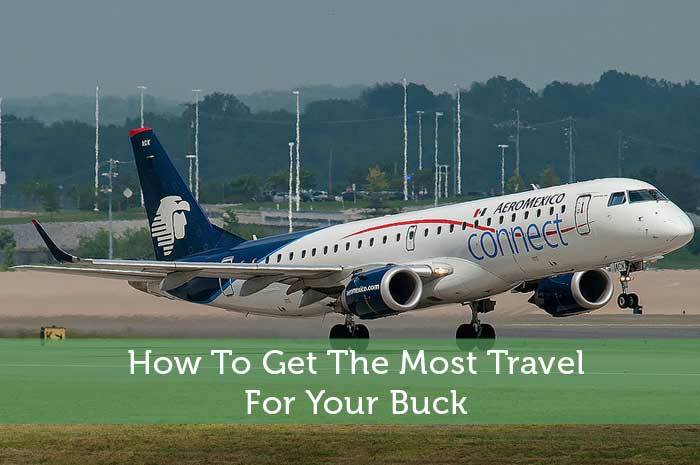 Travel costs can put a big strain on your budget as it is easy to rack up unexpected expenses. Try to find credit cards that offer travel rewards in order to off set potential travel costs. Be sure to hunt around to get the most value per point earned since different credit cards offer a higher or lower value per point. It took us a long time for figure this out, but since we learned to manage our credit cards and not have our credit cards manage us, we’ve done a lot of travel. We love traveling and, as you say, you have to buy things regularly anyway. You may as well get the benefit of doing so. We’ve used United’s cards offered through Chase for years. There was at time that we weren’t fans of United, but stuck with them because of all our points. Lately, they’ve upgraded their technology and service and we appreciate them more. We’ve, also, earned miles through Frontier’s Barclay’s card. Many of those miles have been used for Mexico. Once you master the art of using credit cards, they can work in your favor. Just be cautious so as to not pile of credit card debt.